Comfort is difficult to quantify. We tend to use air perm as our primary metric when working with water barrier materials. 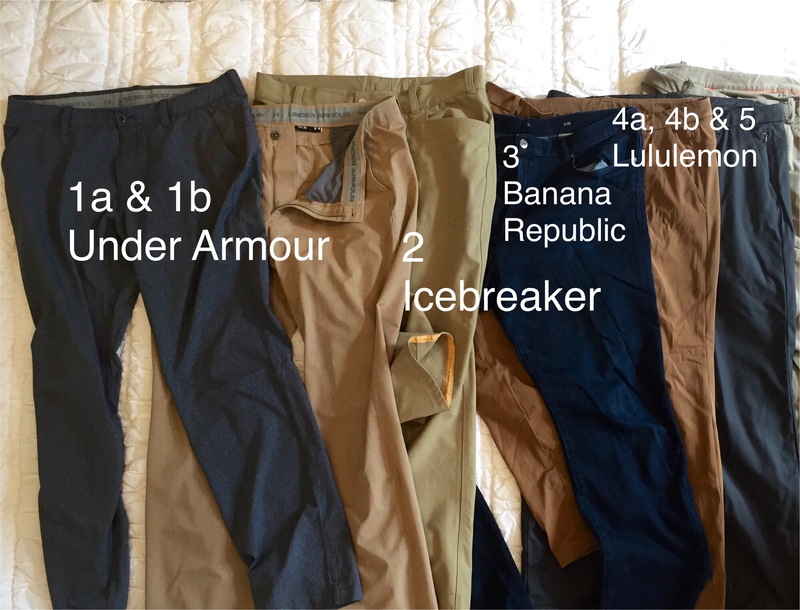 There are many high-end pants now on the market from non-traditional vendors with unique angles on comfort. These are amazing pants. Very light weight, almost like wearing shorts on a hot humid day. They’ve got a tightly patterned series of holes in the fabric that further aids in breath-ability. This pant had an interesting canvas feel that incorporated Icebreaker’s best known ingredient – merino wool. These are nice pants with interesting material, but they are heavy to the point of being nearly the opposite of the UA Match Play. Icebreaker doesn’t have similar pants for sale on their website anymore. These pants were a little short given the size I ordered – the orange flare in the cuff is from where the tailor stretched out every last inch of material when I had them adjusted. Blue Jeans aren’t regular office wear, but this pair from Banana Republic makes use of some interesting fabric. The denim has an elastic feel and is made of a cotton, polyester, urethane blend. They are surprisingly breathable while maintaining the tough outer feel of classic blue jeans. These have been great for flights and long distance travel, and even come in large and tall sizes. This was the first pair of ‘tactical’ office pants that I’d purchased. They are very comfortable and more classy than the UA golf pants, as they’ve got a panel assembly with a piece of stitching right behind the calf. The Commission Pant, now sold as the Qwick Chino, was an improvement on the ABC design, with classic lines and some interesting counter color accent work on the pockets. These are another favorite for long flights and work travel, but the pricing puts them at a clear disadvantage to what Under Armour is able to provide. This entry was posted in Industry, Innovation, Uncategorized and tagged Banana Republic, Casual Wear, Golf, Lululemon, Office Wear, Performance Fabrics, Slacks, Under Armour. Bookmark the permalink.